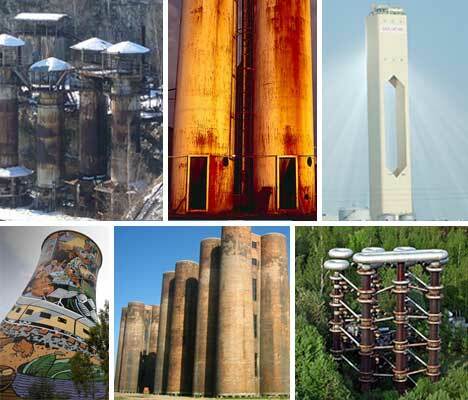 Not many of us would think of industrial towers as impressive pieces of modern architecture, but a closer look reveals that they are, in fact, amazing structures. They have to be able to not only do the job they were built for – guiding smoke or steam, storing agricultural products, or cooling fluids – but to withstand all of the surrounding environmental stresses placed upon them. 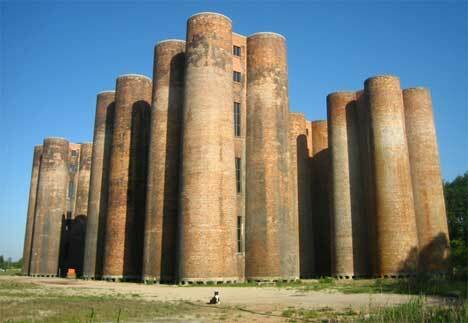 These fantastic industrial towers are often overlooked, but stand as proof of our impressive industrial achievements. 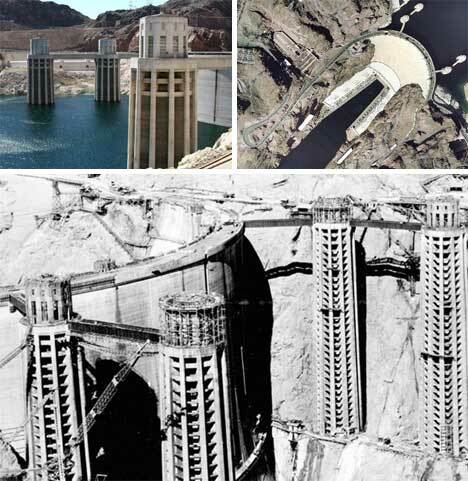 Truly, some of the most impressive industrial towers to ever exist are those that help control the water flow in the Hoover Dam. The towers aren’t usually visible since they are always submerged in a huge amount of water, but they stand an imposing 395 feet tall and help to keep the entire operation running smoothly. When the world began to develop better methods for manufacturing just about everything, the landscape of many places changed. 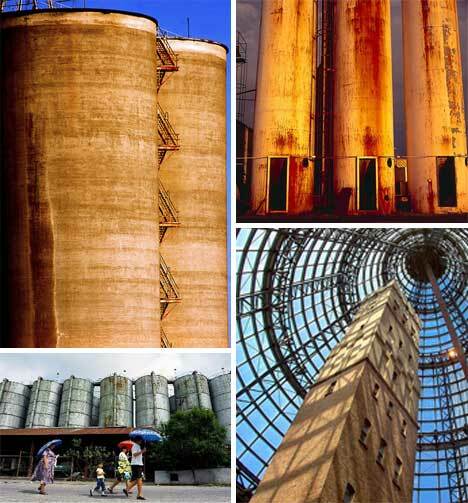 Factories, smokestacks, and agricultural storage towers popped up in the countryside and at work sites to assist with a variety of functions. Today, many of those structures are abandoned and derelict, but some, like the Coops Shot Tower in Melbourne (above, lower right corner) have been preserved as historic treasures. 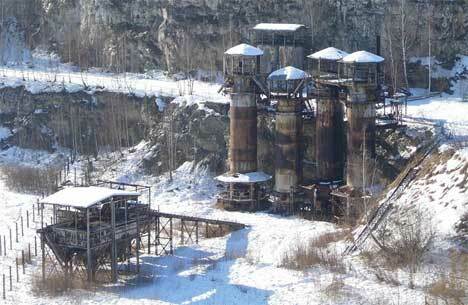 The Liban Quarry in Krakow, Poland has a long and fascinating history. First opened as a quarry in 1873, it was later used as a concentration camp during World War 2. After its closure, it was the setting for the 1993 film Schindler’s List. Today, it is little more than a few abandoned and overgrown structures that seem largely forgotten. These amazing bio-towers once filtered wastewater from a coking plant in Lauchhammer, Germany, but they were taken out of service in 2003. Once doomed to destruction, they have since been saved and are now used to teach visitors about the industrial history of the area. The ever-increasing need for electricity has been the impetus for a great deal of interesting architecture. 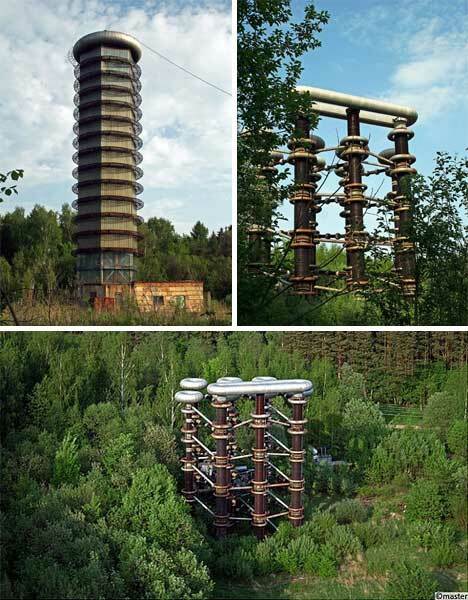 The above mysterious and alien-looking structures can be seen in the Russian countryside, and they are reportedly for high-voltage electricity generation. The towers are continuing the work of Nicola Tesla; much like the bizarre scene from the movie “The Prestige,” these amazing towers light up the night sky with volts of electricity. They were built in the 1970s and are reportedly still in operation. The now-derelict Battersea Power Station in London has ironically become a well-recognized and admired landmark of the city. When its construction was first proposed in 1927, residents felt that a large power station on the bank of the Thames would be an unwelcome eyesore that would negatively affect everyone in the area. The company behind the station remedied the problem by hiring Sir Giles Gilbert Scott to design the building. The architect and industrial designer had previously won a design competition to come up with a pleasing new phone box configuration; his winning red phone box design became a London icon. 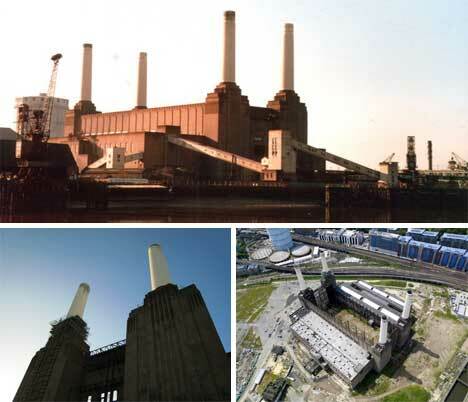 Likewise, the Battersea Power Station went on to become a treasured London building. Its four towers are immediately recognizable, and the building remains the largest brick structure in Europe. The Bankside Power Station is another London power station designed by Sir Giles, though it is arguably more well-known today as the Tate Modern Art Museum. It features only one tower, but is nonetheless still a highly recognizable London landmark. 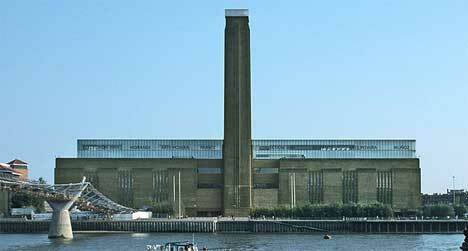 It was decommissioned as a power station in 1981 and converted to the Tate Modern in 2000. Regardless of how you feel about nuclear power, the architecture of the familiar hypberboloid cooling tower associated with nuclear power plants is instantly recognizable and undeniably fascinating. These towers stand like silent sentinels, guarding their power stations or simply creating a small spot of interest on the landscape. 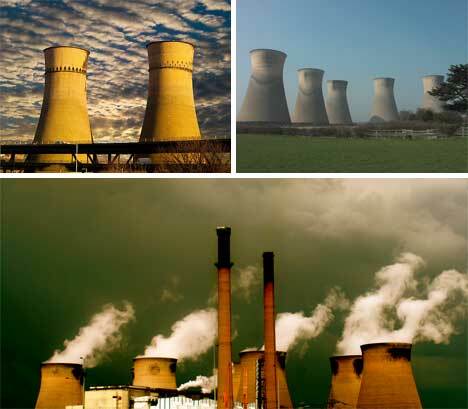 Many nuclear power stations which have been demolished have left behind their cooling towers, often because it is expensive and complicated to destroy them in a safe manner. At least one nuclear power plant is taking strides to warm the public to its presence. 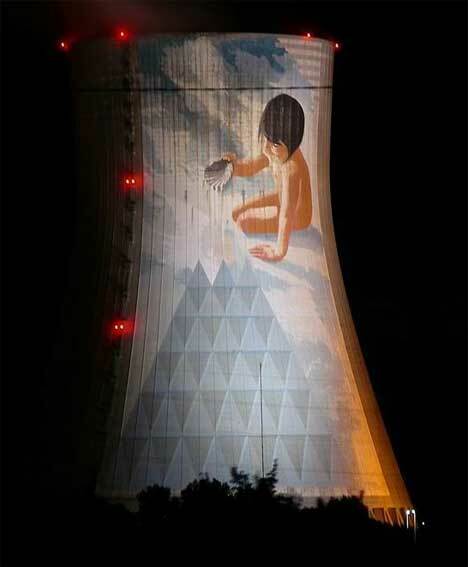 The Cruas Nuclear Power Station in France commissioned artist Jean-Marie Pierret to create a giant mural on a cooling tower; the mural was finished in 2005 and focuses on the interplay of water and air. Maybe the most well-known decorated cooling towers in the world are those at the decommissioned Orlando Power Station in Soweto, South Africa. After supplying coal-powered electricity to the area for more than half a century, the plant was shut down in 1998. 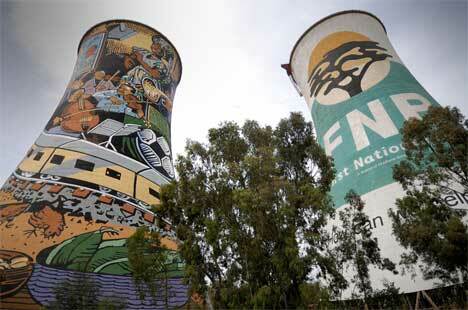 The cooling towers remain, though – one now sports a huge advertisement, and the other is home to the largest mural painting in South Africa. In addition to being one of the most recognizable landmarks in the area, the site is home to bungee and BASE jumping, a power swing, and various other thrill-seeking attractions. 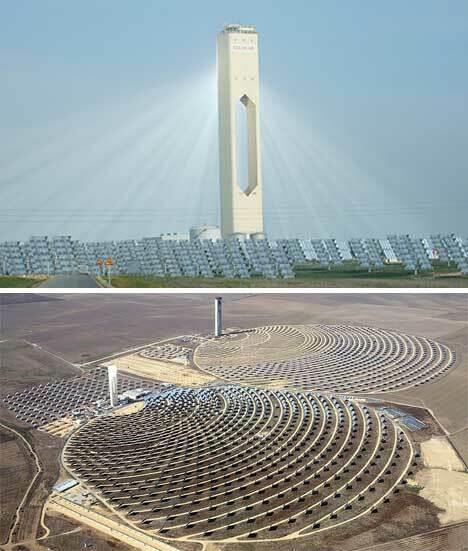 The PS10 and PS20 solar power towers near Seville, Spain aren’t the only solar power towers in the world, but combined they make the most powerful solar thermal energy plant. Their futuristic design and purpose only add to the wonder that accompanies most people’s first glimpse of the incredible structures. They were designed to be as visually unobtrusive as possible, but the concrete towers are so simple and beautiful that they still draw their share of amazed stares.